Hyperammonemic crises (HACs) in patients with urea cycle disorders (UCDs) are associated with mortality and intellectual/cognitive decline. Fasting ammonia correlates with daily ammonia exposure and the risk and rate of HACs. UCD patients receiving sodium phenylbutyrate (NaPBA) and switched to glycerol phenylbutyrate (GPB) in three short-term comparative studies were examined over a 12-month period during dosing with GPB to identify characteristics associated with HACs. UCD patients completing long term studies (n=100) and those who had HACs were examined for the following: 1) Demographics, 2) Incidence and rate of HAC, 3) Time to first HAC, and 4) Duration of, and hospitalization for, HACs. Comparisons were reported for the pre-study and the 12 month follow-up study. The percentage of people experiencing a HAC in the study was 19%. HAC risk was 5-7 times higher in those reporting the higher ammonia levels compared to lower levels. Significant reductions in HACs were noted in the long term follow-up as compared to the pre-study period in both pediatric and the overall population. During pre-study, 44% of pediatric patients had experience at least one HAC as compared with 25% of children experiencing a HAC during the long term follow-up while on GPB and a higher proportion of males experienced a HAC in the pre-study period (42%) compared to females (24%). The mean duration of a HAC was just under 2 days and hospitalizations were more frequent in the pre-study period. Ammonia levels were higher during hospitalization in the pre-study period but by discharge they were not different. UCD patients on chronic nitrogen scavenging therapy showed an overall incidence of HACs of 20%, with rates higher with increased ammonia exposure. HAC rate was lower with long term treatment with GPB as compared to pre-study treatment with NaPBA in both pediatric and the overall population studied. A urea cycle disorder (UCD) is a genetic defect in one of the six enzymes or two transporters that compose the urea cycle and can result in significant hyperammonemia. It is an ultraorphan disease with an estimated prevalence of about 2,000 cases in the United States, with an incidence of about 1 in every 25,000 newborns . Left untreated, the hyperammonemia from UCDs can result in significant morbidity and mortality, particularly in neonatal or early onset . However, symptoms may present at any age, due to the varying degrees of acute and chronic hyperammonemia and the UCD enzyme reserve of the patient, resulting in cognitive decline such as decreased executive mental function [2-4]. Two-thirds of patients present with findings after the newborn period. Those patients who experience very highly elevated ammonia levels ((hyperammonemic crises) are particularly at risk . Limited data exist on the patient characteristics and incidence of HACs in UCD patients on chronic nitrogen scavenger therapy. Previous analyses of data from 100 patients who participated in the pivotal efficacy trials for the nitrogen scavenger, glycerol phenylbutyrate (GPB) have indicated that fasting ammonia > than 1 times the upper limit of normal (ULN) predicts a HAC over 12 months in 37% of patients and that a 25 μmol/l increase further elevates that risk by over 200% . Herein, we further characterize the HAC data from this analysis. Detailed explanation of the methodology including inclusion/exclusion criteria have been previously described . In summary, UCD patients who were predominantly receiving sodium phenylbutyrate (NaPBA) were switched to GBP in 4 short term trials and then entered into one of three open label 12 month follow-up trials (ClinicalTrials.gov identifiers: NCT00551200, NCT00947544, NCT00947297, NCT00992459, and NCT01347073). Data from the four shortterm studies evaluated ammonia control during equivalent dosing of GPB versus NaPBA [7-9] and three 12-month safety extension studies in 100 adult and pediatric UCD patients were used in this analysis [6,10,11]. The trials compared 24- hour ammonia levels during short-term steadystate dosing with GPB or sodium phenylbutyrate (NaPBA) and studied longer-term outcomes, including HACs, among 100 UCD patients, including 49 pediatric patients, treated with GPB for up to 1 year. HACs were defined as compatible clinical symptoms associated with one or more ammonia levels ≥ 100 μmol/L. Duration of HAC (Defined as the interval between the time of the admission and discharge ammonia values recorded during a HAC). Descriptive data was captured for all patients at pre-study (retrospective analysis on NaPBA), baseline (when enrolled), and during study. The distribution of patient characteristics was analyzed by HAC outcome. Covariates controlled and examined included age, weight, drug type, and total daily dietary protein intake. Time to first HAC was determined by Kaplan- Meier analysis for the entire population, by age group, dichotomous age group, and gender and baseline ammonia categories. For age, baseline ammonia, gender and race, we computed the proportion of subjects who experienced a HAC between covariate values. Event rates of HACs were examined using Kaplan Meier (KM) plots and calculated p-values for significant differences. Univariable Cox regression analyses for time to first HACs during the study were also completed. To assess the association of predictors with duration of HACs a generalized estimation equation logistic regression model and mixed linear modeling was undertaken.. Since none of the potential covariates, as well as gender and UCD subtype, had any effect on the rate of HAC examined  these data are presented in aggregate here. The cohort was composed of equal number of pediatric and adult patients who were primarily white females, with OTC being the most common UCD (Table 1). There were 30 patients who had a total of 53 HACs during the pre-study period and 19 patients who had 27 HACs during the study period, representing a 12 month rate of 0.581 and 0.288 respectively . Table 1: Demographics of Study Population. The overall population and pediatric patients showed statistically significantly decreased rates of HACs during the study period as compared with the pre-study period (Figure 1). The descriptive covariate analysis of patients indicated that the overall percentage of people that experienced a HAC was 19 % (Table 2). Baseline ammonia was higher in those experiencing a HAC than those not experiencing a HAC. The mean age of subjects who experienced a HAC was lower than the subjects who didn’t have a HAC (12.9 versus 21.2) and the biggest reduction in HAC incidence pre-study versus long term follow-up was in patient’s ≤18 years of age. Figure 1: Number of HACs Pre-study and Long term Follow-up. Adapted from Reference 6, ‘pre-enrollment’ included HAC analysis of patients on therapy with sodium phenylbutyrate and on study’ included therapy with glycerol phenylbutyrate, p values used mean differences in HACs were calculated with Wilcoxon signed rank test. Table 2: Descriptive statistics of subjects who experienced a HAC and those that did not during the study period. During pre-study analysis, 44% of pediatric patients had experienced at least one HAC as compared with 25% of children experiencing a HAC during the long term follow-up while on GPB and a higher proportion of males experienced a HAC in the pre-study period (42%) compared to females (24%) (Table 3). Rate of HACs was similar for those with more rare forms of UCD versus those with the more common ornithine transcarbamylase deficiency (19% each). Table 3: Descriptive statistics of subjects who experienced ≥1 HAC or no HAC in the Pre-Study Analysis. After a median time of follow-up of 361 days while on GBA, 80% of subjects had not experienced a HAC (Figure 2). There were no associations between race, gender, and type of UCD. There were no associations between age and time to HAC (p 0.3259), but patients less than 18 years of age experienced a directionally higher risk (p value 0.2, Table 4). 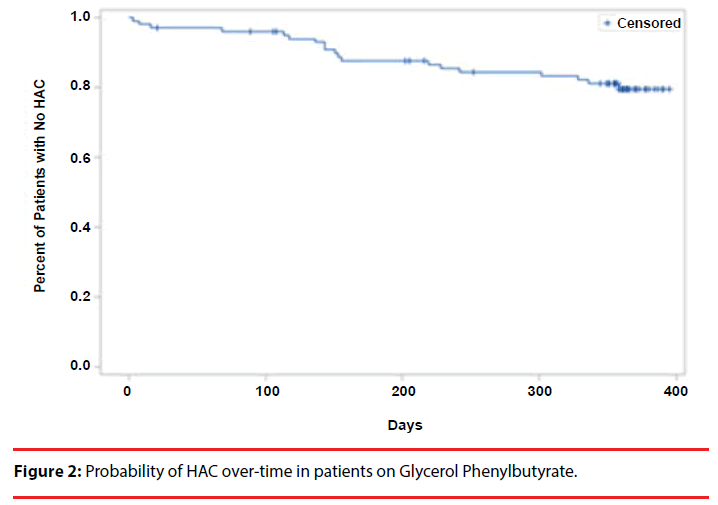 Figure 2: Probability of HAC over-time in patients on Glycerol Phenylbutyrate. Table 4: Results for time to first HA crisis during long term follow-up. Ammonia exposure, both baseline (Table 4) and during long term follow-up, was associated with a higher risk of first HACs . The risk of a HAC was approximately 5 times higher in the highest ammonia levels (i.e. greater than 1 times ULN) as compared to lowest ammonia categories (Table 4). After adjusting for age, gender and race, we still observed a significant difference in HAC incidence between baseline ammonia categories (Table 5). Age shows a marginally significant difference in HAC incidence after controlling for baseline ammonia, gender and race, with pediatric subjects having a higher incidence (rate ratio 2.62) of HAC compared to adult subjects (Table 5). Further, patients aged 6 and older with a baseline ammonia of ≥ 1 ULN value, have over 20 times (odds ratio 20.3) the risk of having a first HAC compared to subjects with ≤ 0.5 ULN baseline ammonia values (p=0.009). Table 5: Multivariate analysis of rates of HAC during long term follow-up. In those patients with data on HAC duration (n = 25), the mean time of HAC was just under 2 days (1.71). In mixed modeling evaluations, there were no significant predictors associated with the duration of HAC, though patients with lower baseline ammonia levels (<1 ULN) had higher odds (odds ratio 3) of experiencing shorter duration HAC compared with higher baseline ammonia levels (≥ 1 ULN). Total hospitalizations associated with HACs were more frequent during the pre-study period versus the long term follow-up with GPB (35 versus 27, p 0.22) and mean in hospital ammonia levels were also higher (223.2 µmol/L versus 153.6 µmol/L, p 0.19). Mean ammonia levels at discharge were similar (37 µmol/L and 31 µmol/L). Prior to the advent of modern UCD treatment regimens including exogenous nitrogen scavengers along with low protein diets and appropriate amino acid supplementation, patients with UCDs presenting in the newborn period that survived nearly all suffered significant neurocognitive and developmental deficits that correlated with the number, severity, and duration of HACs [1,4,5]. Since that time mortality and cognitive outcomes have improved, but survival has brought with it new challenges in the management of UCD patients . Patients with some residual enzyme activity and even presumably asymptomatic patients have been found to have significant risks for learning and developmental disabilities associated with chronically elevated ammonia levels [2-5]. As an example, in a very large longitudinal study over 20 years , 76% of patients presenting with a HAC already had significant neurological symptoms within a very broad age range (1 day to 53 years), indicating that HACs do not predominately now present in early life. Indeed as seen in our analysis, of patients already diagnosed and currently treated for a UCD, the baseline range was from 2 months to 70 years of age and those presenting with a HAC had a mean age of 13. The age group of 2 to 12 years is thought to be a particularly vulnerable time period for first HAC and our data indicated that those less than 18 years were at higher risk for first HAC as compared with those greater than 18 years. The overall rate of HACs was 0.29/patient/year in the long term follow-up group in this analysis which was lower than that found in a large longitudinal study which was slightly less than 1 HAC/patient/year . The longitudinal study findings are closer to what we found in the pre-study population where the rate was 0.58/patient/year. These results likely represent differences in the patient populations studied, with the current analysis including only chronically managed patients on nitrogen scavengers. The results do show that in a case control patient population HACs can be reduced even over a relatively short period of time with appropriate therapy and monitoring. Previous findings from this data indicate that fasting ammonia levels, and glutamine to a much weaker extent, correlate with daily ammonia exposure and that these values are also predictive of a future HAC [6,10,11]. Modeling data in this analysis indicate that fasting ammonia of ≥1.0 ULN was found to increase the probability of high daily ammonia exposure and 37% of these patients experienced ≥1 HAC over 12 months. Forty-four percent of patients who had HACs in the pre-study portion of this analysis had fasting ammonia of ≥1.0 ULN. In contrast, of those patients with <0.5 ULN only 23% had a HAC. Though glutamine in these studies was found to be a weak predictor of HACs in those on chronic nitrogen scavenger therapy , glutamine >1000 μmol/L has been suggested to represent chronic suboptimal ammonia control necessitating tighter management of the patient . Longitudinal logistic modeling evaluating the odds of worsening neuropsychological test scores in relation to increases in blood glutamine and ammonia levels, indicate that glutamine levels predict worsening of perceptual motor skills, as evaluated in a battery of tests . Fasting ammonia is a proxy for daily ammonia exposure and its increase above the ULN in patients chronically treated with nitrogen scavenging agents is predictive of a hyperammonemic event. The rate and severity of hyperammonemic events are associated with worsened neurocognitive outcomes. 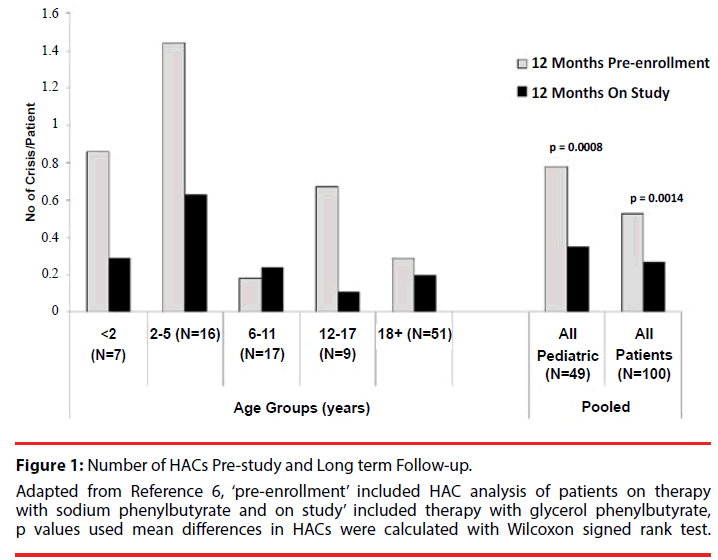 Higher HAC rates were observed in patients treated with sodium phenylbutyrate (particularly in the pediatric population) before being switched to glycerol phenylbutyrate, most likely representing better daily ammonia control as shown here. Since even mildly elevated ammonia levels in UCD patients increase risk for HACs, it has been suggested  that fasting ammonia concentrations <0.5 ULN be maintained to increase the chances of preventing a HAC and the sequelae associated with chronic hyperammonemia. The authors gratefully acknowledge the many investigators, study coordinators, and statisticians who generated the original data upon which this analysis was built. Their names and affiliations are listed in the original publication (reference 6). Summar ML, Dobbelaere D, Brusilow S, et al.Diagnosis, symptoms, frequency and mortality of 260 patients with urea cycle disorders from a 21-year, multicentre study of acute hyperammonaemic episodes. Acta. Paediatr97(1), 1420-1425 (2008). Gropman AL, Prust M, Breeden A, et al.Urea cycle defects and hyperammonemia: effects on functional imaging. Metab. Brain. Dis28(1), 269-275 (2013). Gropman AL, Fricke ST, Seltzer RR, et al.1H MRS identifies symptomatic and asymptomatic subjects with partial ornithine transcarbamylase deficiency. Mol. Gen. Metab95(1), 21-30 (2008). Posset R, Garcia-Cazorla A, Valayannopoulos V, et al. Age at disease onset and peak ammonium level rather than interventional variables predict the neurological outcome in urea cycle disorders. J. Inherit. Metab. Dis39(5), 661-672 (2016). Batshaw ML, Tuchman M, Summar M, et al.A longitudinal study of urea cycle disorders. Mol. Gen. Metab113(1), 127-130 (2014). Lee B, Diaz GA, Rhead W, et al.Blood ammonia and glutamine as predictors ofhyperammonemic crises in patients with urea cycle disorder. Gen. Med 17(7), 561-568 (2015). Lee B, Rhead W, Diaz GA, et al.Phase 2 comparison of a novel ammonia scavenging agent with sodium phenylbutyrate in patients with urea cycle disorders: safety, pharmacokinetics and ammonia control.Mol. Genet. Metab 100(3), 221-228 (2010). Lichter-Konecki U, Diaz GA, Merritt JL 2nd, et al.Ammonia control in children with urea cycle disorders (UCDs); phase 2 comparison of sodium phenylbutyrate and glycerol phenylbutyrate. Mol. Genet. Metab103(4), 323-329 (2011). Smith W, Diaz GA, Lichter-Konecki U, et al. Ammonia control in children ages 2 months through 5 years with urea cycle disorders: comparison of sodium phenylbutyrate and glycerol phenylbutyrate. J. Pediatr162(6), 1228-1234 (2013). Berry SA, Lichter-Konecki U, Diaz GA, et al.Glycerol phenylbutyrate treatment in children with urea cycle disorders:Pooled analysis of short and long-term ammonia control and outcomes. Mol. Gen. Metab112(1), 17-24 (2014). Lee B, Diaz GA, Rhead W, et al.Glutamine and hyperammonemic crises in patients with urea cycle disorders. Mol. Gen. Metab117(1), 27-32 (2016).